Memorial Day Weekend was going to be an epic trip, heading north to Vermont to check off the Vermont City Marathon from my marathon list and also sing at the start of the race! Friday night, I had a flight leaving LaGuardia direct for Burlington, Vermont. Getting off the ground, though, was a bit dramatic... first, we had a maintenance issue delaying us because the fuel gauge wasn't displaying correctly; then the computer systems displayed "faults." After restarting the plane twice (literally, turning the power off and waiting for the systems to reboot, like a CTRL+ALT+DELETE on a PC) we're ended up deplaning after an hour of delays, moving to a new aircraft altogether. When all was said and done, we landed at Burlington International Airport at 1AM. Donna picked me up from the airport after napping in the cell phone lot waiting for my flight to get in. 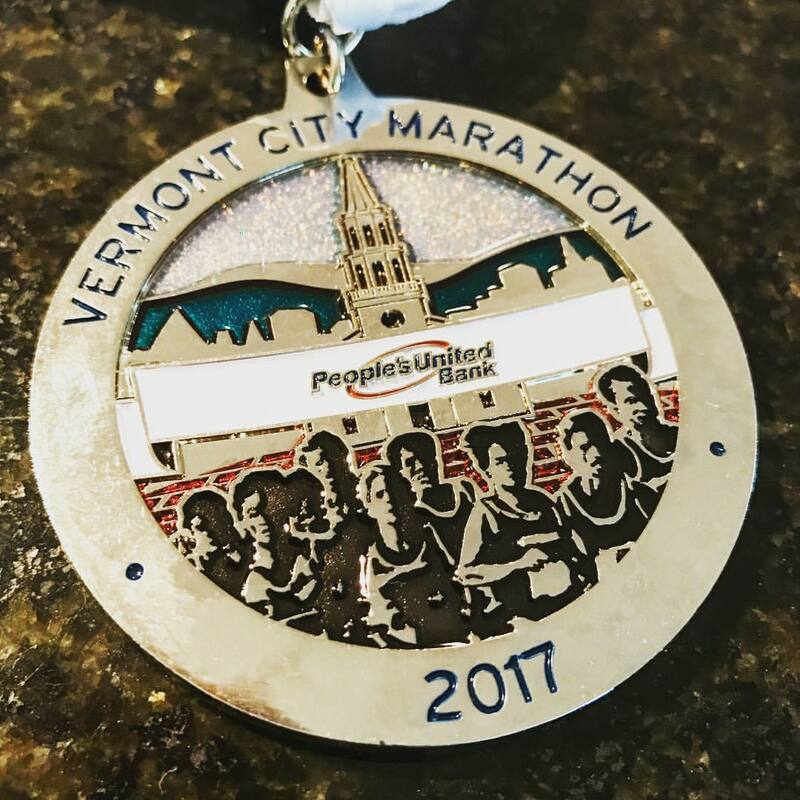 We headed to our hotel to crash for the night, as I was getting up early the next morning for my first of two national anthem gigs as part of Vermont City Marathon weekend. Early the next morning, I was picked up by a Vermont City Marathon staff member, Patti, to take me to the start of the kids' races (MVP Health Care Ready. Set. Run! 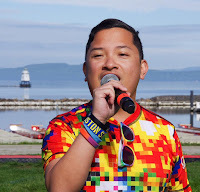 Festival) at Waterfront Park along the shore of Lake Champlain, where I got to perform the national anthem. There were tons of kids that participated in that morning's races, some of them running at a blazing fast speed that I've never even been able to accomplish! 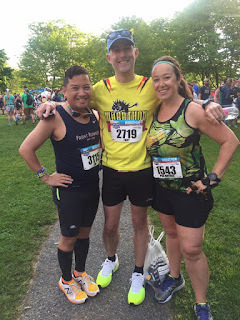 After the events of the morning, I headed off to the race expo via Uber to meet up with Donna and David, aka Foxy, a runner from England who was also rooming with us for the first two nights of the weekend. The expo was at the Sheraton, hosting over 40 local and national exhibitors. 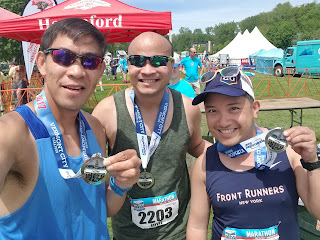 We picked up our bibs for the race, and stopped by the Hartford Marathon booth, where they were advertising the "New England Double" challenge, where if we ran both Vermont City and Hartford tin the same year, we would receive a special New England Double Medal and a New England Double Running Jacket. 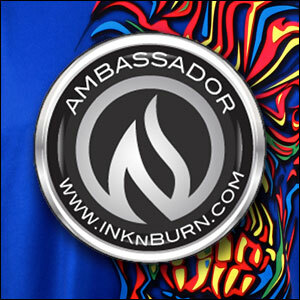 Sadly, as much as I kept on eyeing that medal, I couldn't make it work, as Detroit had me for the same weekend in October, and the logistics in getting my bib for Detroit (where an in person bib pickup with passport was required due to the international border crossing) would be futile. Hartford would have to be saved for another year. After a little time at the expo, the three of us headed out to explore more of Vermont for the rest of the day, and we definitely hit up the area! Time to go on a tour and have some ice cream! 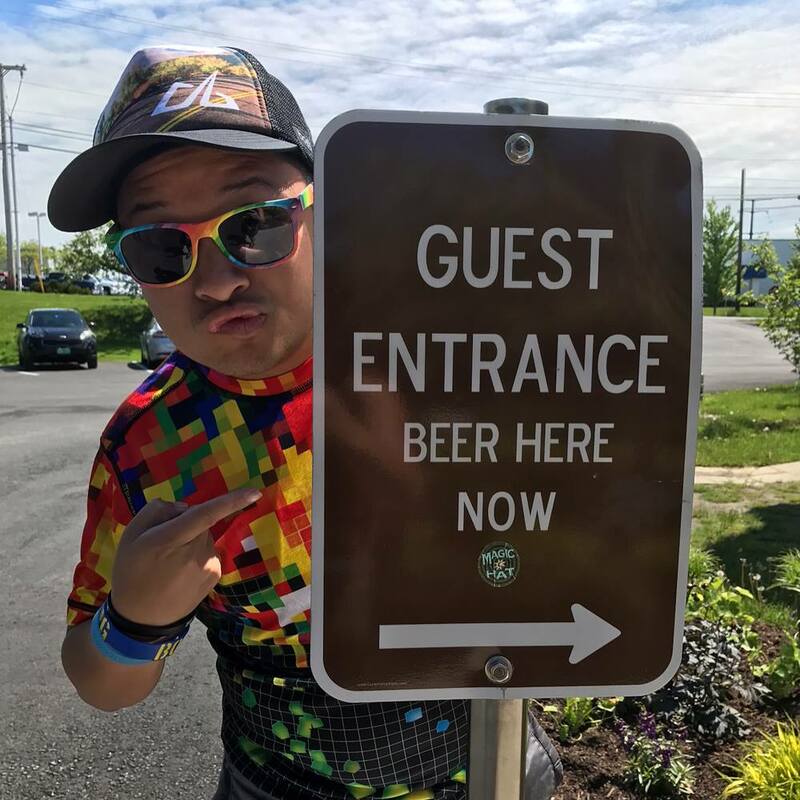 Off to Magic Hat Brewing Company! After our runaround of our food tour of Waterbury, where we didn't need to get lunch anymore from all of our food sampling, we headed back toward Burlington and Shelburne to begin an afternoon of brewery stops, including nationally popular Magic Hat Brewing Company in South Burlington, followed by Fiddlehead Brewing Company in Shelburne, which happened next to a fun Memorial Weekend festival happening in the open field next door. 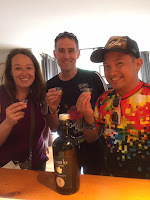 We also crossed the busy US Route 7 to stop by Shelburne Vineyard to try some ice wines. As the afternoon began to wane, we headed back into Burlington, but made some stops by some fun street art that we had observed as we initially drove by on our way to Fiddlehead. This included a life-size toy jack made out of red fire hydrants and a large dog made out of hay bales. 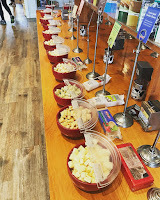 We also stopped by the Shelburne Country Store, an original 1859 Vermont country store with a variety of gifts to choose from, as well as fudge and jam samples (OMG MORE FOOD) and an antique toy shop! We headed back into town for dinner at Vermont Tap House, where we met with one of Donna and Foxy's friends, Wally... and of course, what did we do - but EAT AGAIN. 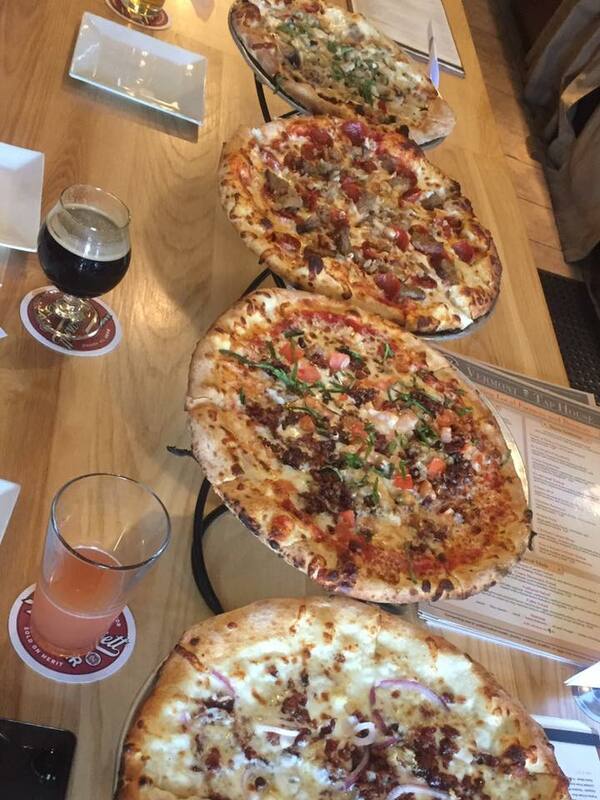 The evening consisted of some absolutely delicious pizza and MORE beer, before we retired back to the hotel, to rest off the incredible amount of food and drink we had taken on for the day. 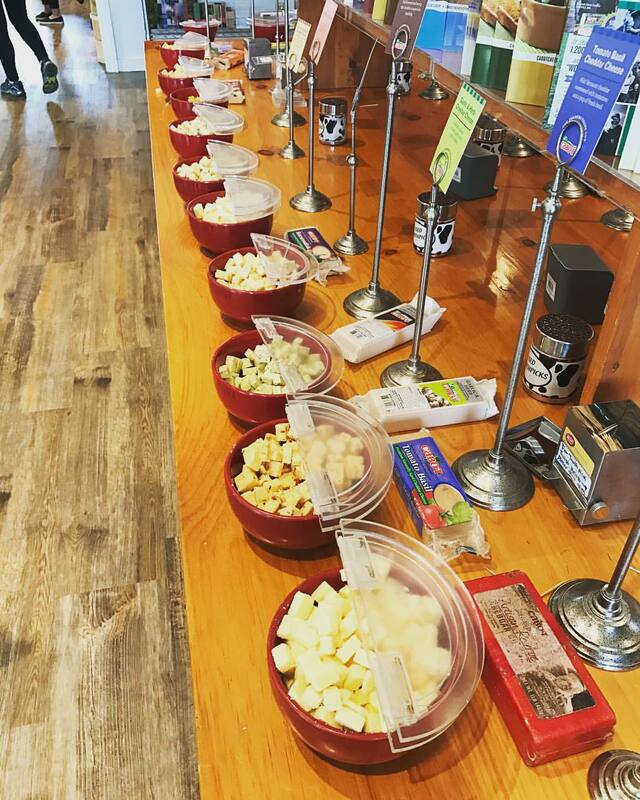 You can at least say we were probably carb-loaded, ha! Early the next morning, we headed into town, parking about a ten minute walk from the startline, down the hill from Battery Park - a hill I'd later be cursing after having to climb up it at the halfway point! It was nice seeing getting together with some old friends in Battery Park as we got ready for the start. It was a balmy 54°, and perfect weather to run this morning. 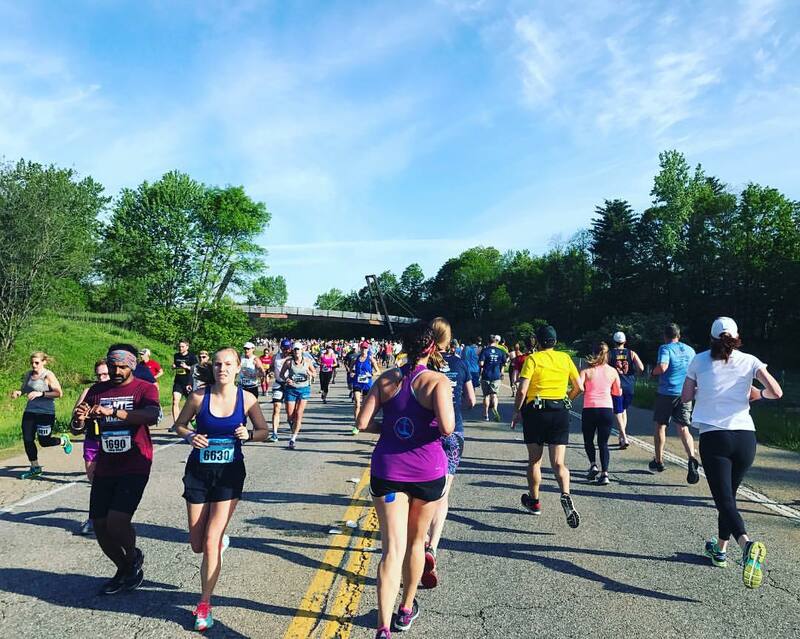 The forecast had it getting up into the 70s, but not nearly as warm as it was the previous year, where the race was black-flagged due to the wet bulb globe temperature exceeding 82. About half an hour before the start, I headed to the start stage where I would be singing the anthem. Just minutes before I would sing, I gave an interview on live tv with popular local weatherman Tom Messner with Burlington, VT/Plattsburgh, NY's NBC affiliate My NBC5, to chat about my national anthem challenge and running the Vermont City Marathon as part of my efforts to run all fifty states. I even gave him my expected finish time of around five hours... really hoping that I'd actually be able to beat it! The anthem went over quite well, and so many thanks to communications director Jessica Ahearn Cover, race director Peter Delaney, and the amazing staff of RunVermont for giving me this incredible opportunity to sing for your race! After singing, I headed into the corrals curving around the north edge of the park on Sherman Avenue. Just before the start, I end up running into my Front Runners New York club coach, Mike, getting into the corral, also sporting our club's singlet! 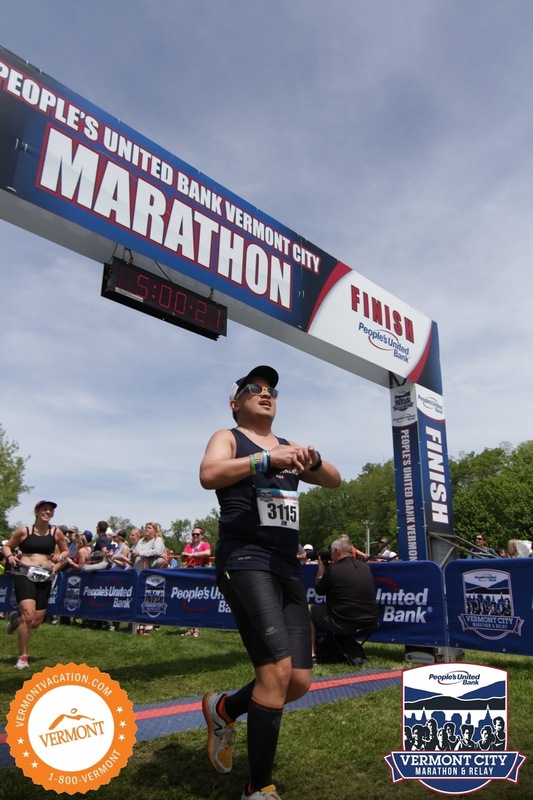 His daughter Maud is going to school at the University of Vermont, so he decided to do the race as well! 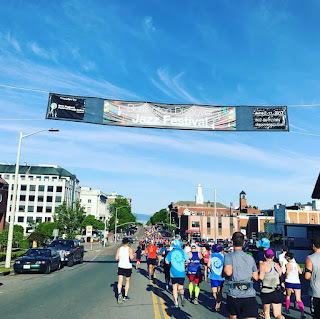 At 7am, we were off, ready to conquer the "cloverleaf" like course of the Vermont City Marathon, a course that can easily be separated in four different sections. As we took off down Park Street, we turned the corner onto Pearl Street, while bells began to toll at the Cathedral Church of St Paul. Let's get state #29 started! 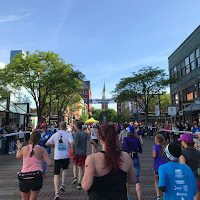 We ran about 3/4 of a mile eastward along Pearl Street and then turned right onto Willard Street, hitting the first mile. I actually didn't realize it as I went along, but the first 1.5 miles of the course was uphill, especially going up Willard Street. Despite this, I still managed a 9:13 first mile and 9:48 second mile. It was nice and downhill as the street made a slight right turn, and then as we turned to go up Union Street back into the downtown area. 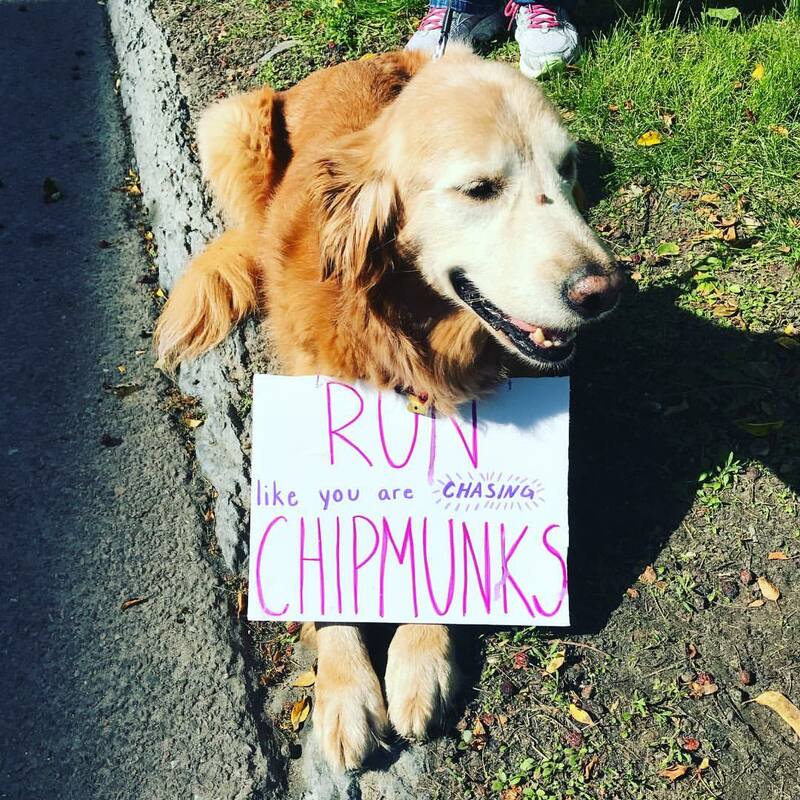 The residential area we ran through had many people cheering us on, and lots of dogs out with their owners observing the race. 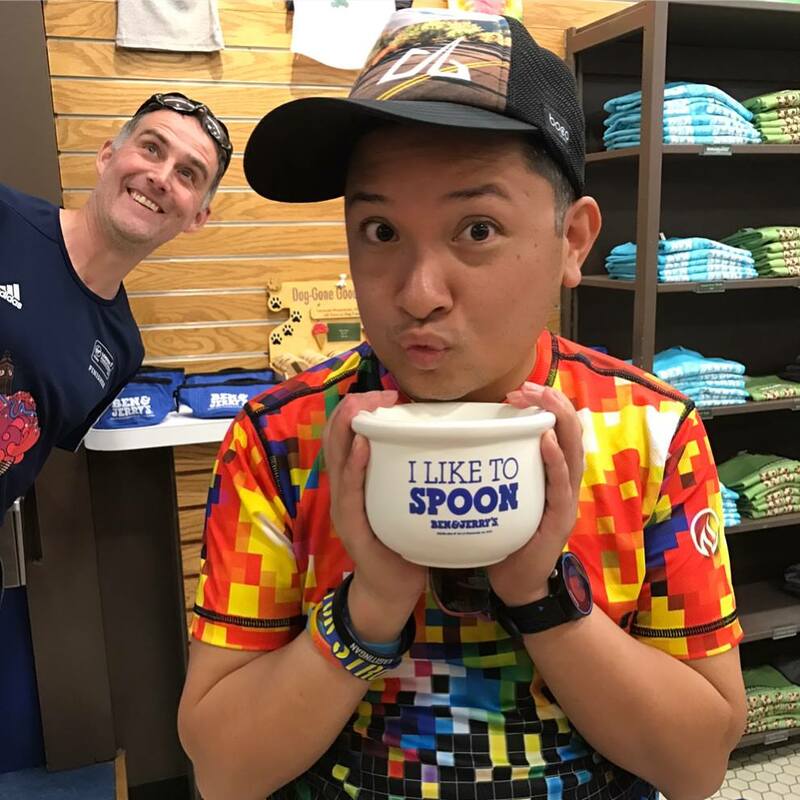 We returned to the downtown area, heading north along the Church Street Marketplace for the first time, and watched the handcyclist in the lead go by along the opposite side of the brick street... or at least, heard him, as he was moving SO fast. 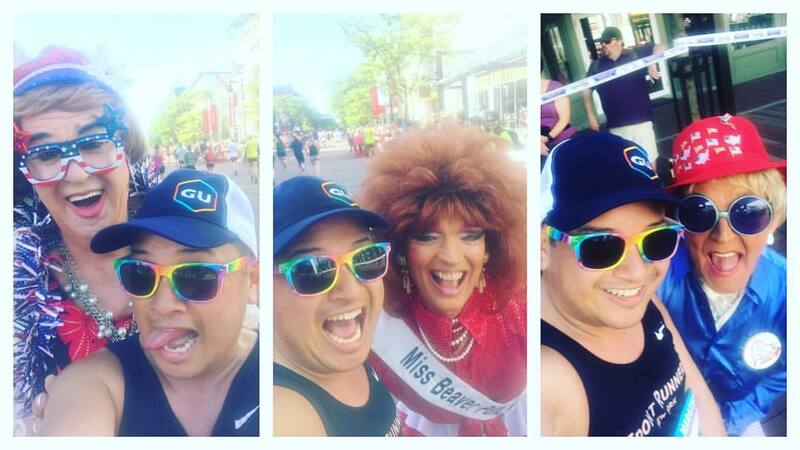 We encountered the drag queens from the House of LeMay at the top of Church Street, but having analyzed the course map and saw the handcyclist coming down Church, I knew I was coming back so I held off for a picture with them until I came back through. We turned left onto Cherry Street, and got to the 5k mark at right about 30 minutes in. 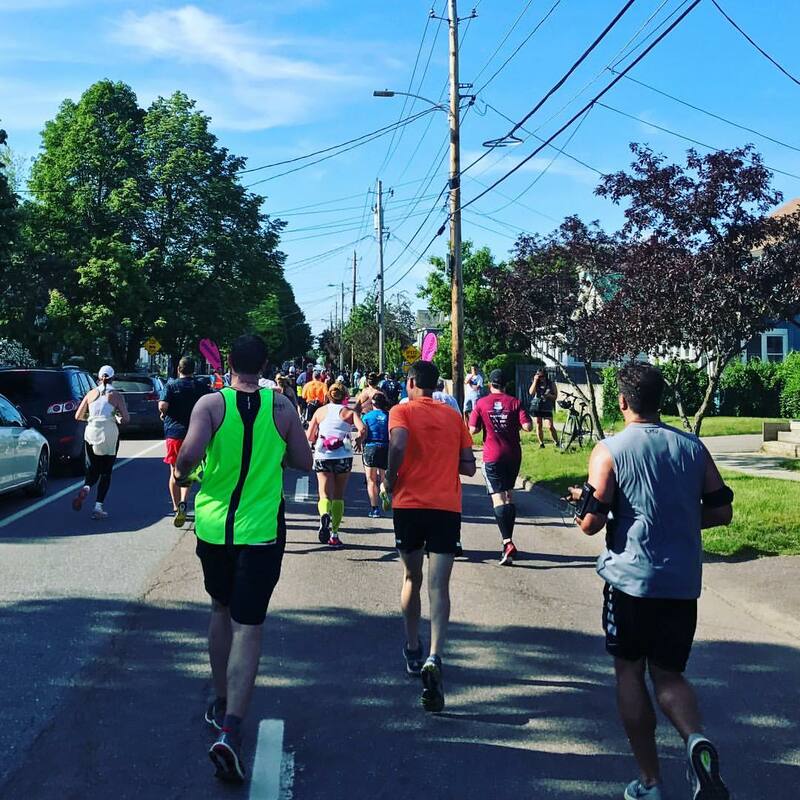 I loved the sheer amount of support out on the course while we passed through the heart of Burlington. Heading northward, we passed the start line banner for the first time, with the announcer spotting me and calling me out as I passed by! I had a feeling this was going to happen often. 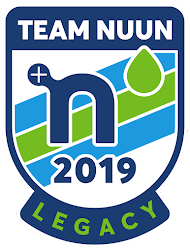 As we began the second "leaf" of the clover, I began to realize just how many volunteers were out participating in the logistics of this race. At practically every speed bump along Park Street in the Old North End, there were two volunteers, donning signage, audibly calling out the potential trip hazard. 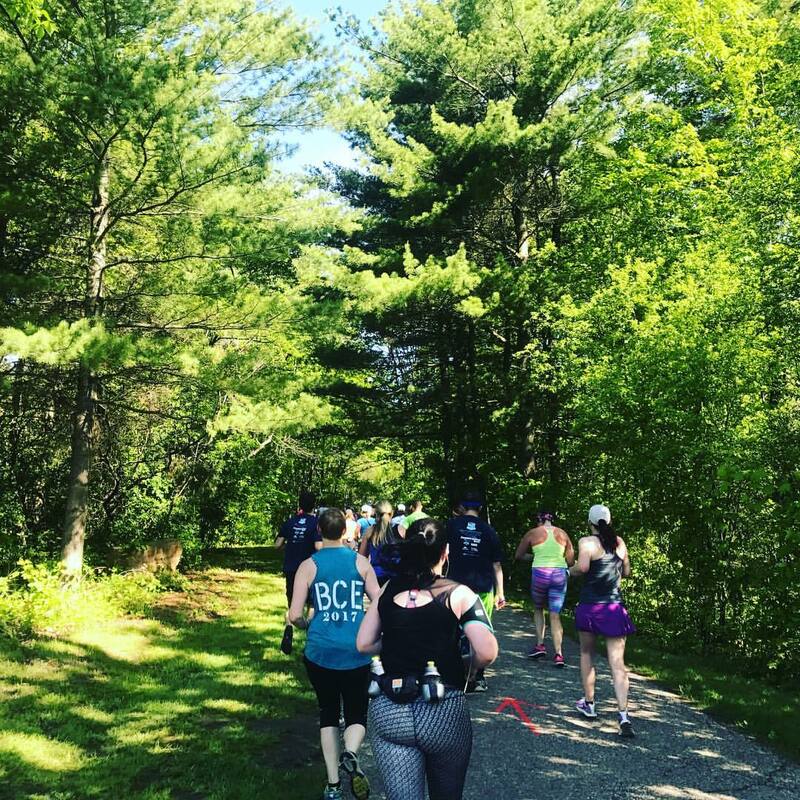 As we continued northward, we moved out of the quiet residential Old North Area and ran onto Vermont Route 127, better known as the Burlington Beltline. It was still a lot of fun along what essentially was quiet highway. The sun was out in full force by this point in time, 4 miles into the race, and I was sweating bullets, but suddenly I encountered a guy still wearing his long sleeved jacket; evidently, he was playing Pokemon Go while running the marathon, "catching Snorlaxes," whatever that is. I would later end up finding him crossing at the finish... STILL wearing his jacket when the temps had gone up 21 degrees from the start. Ahead of 4:15... for now. 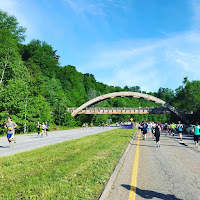 On the Burlington Beltline, we got to run under some cool architecturally beautiful bridges. 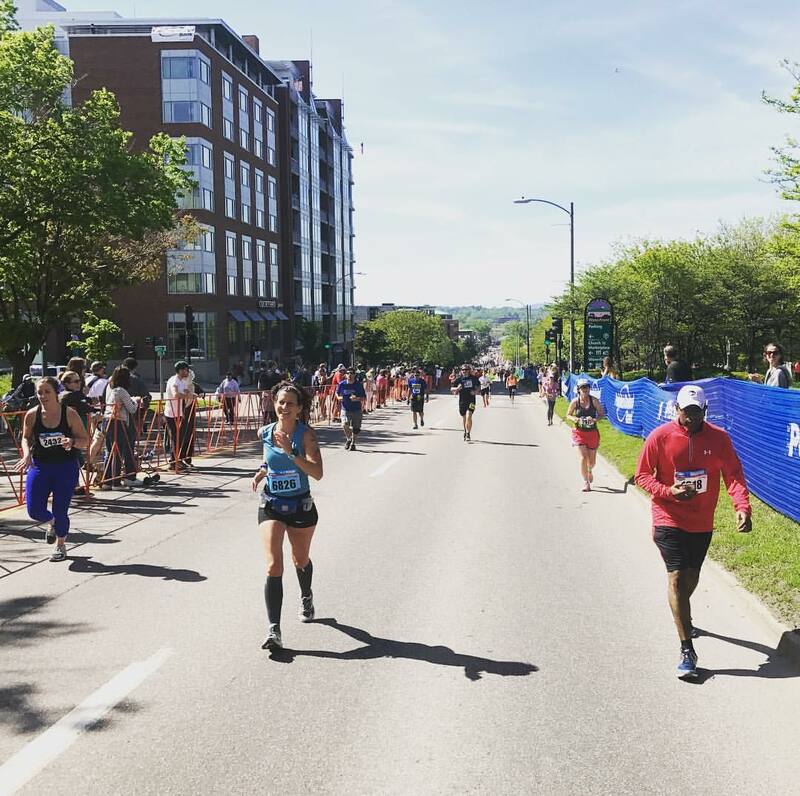 I felt like I got into a good solid groove as we were on this section of the course, especially as it was an out and back, and I could see some familiar faces along the way. Miles 4-7 were speedy - a 9:21 at mile 4, 9:25 at mile 5, 10:02 at mile 6, and a 9:39 at mile 7. 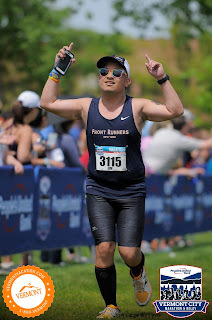 I was progressing well enough to even be in front of the 4:15 pacers, a feat I was even surprised with accomplishing at this point of the race. The 10k mark was roughly where we made a turn around, heading back along the Beltline back into the downtown area, where we would eventually finish leaf 2 of the clover and embark on leaf 3. 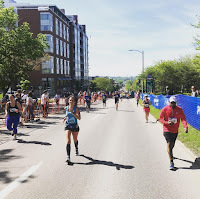 We ran back along Park Street, with lots of people cheering us on, and volunteers noting the speed bumps, while passing the start line banner for the third time. as we were warned with bright pink signs and vocal volunteer course marshals! cheering us along Church Street! We looped through downtown yet again to begin part 3, running along the Church Street Marketplace, and this time I made sure to get pictures with each member of the House of LeMay. Somewhere along the way, I let the 4:15 pacers pass me by, knowing full well that that was going to happen. I mean heck, I was getting photos taken! Priorities, right? ;) Eventually, we made our way down to Burlington's South End, as we began a nice 1.4 mile long and steady downhill along Pine Street, a more commercial section of Burlington. 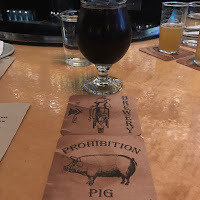 All along Pine Street, we passed by several notable Burlington breweries and cideries - Citizen Cider, Zero Gravity Brewery, and Queen City Brewery, as well as the Lake Champlain Chocolates factory store. Cute dogs, fun signs. I CAN'T. 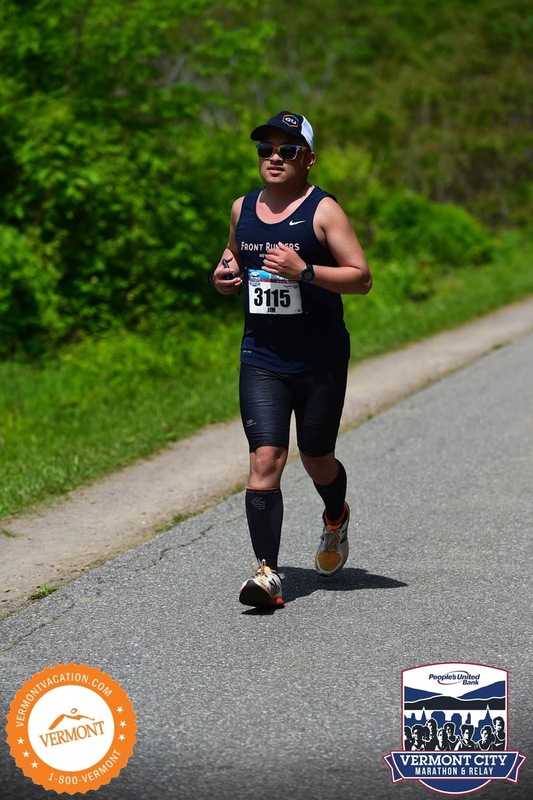 Just before the 10 mile mark, I see runners coming UP toward my direction... so then I realized, yuck, I have to return on an uphill. The sun began to take its toll and the temps were rising steadily. By this point of the race, it had gone up ten degrees to 65, so race officials began to change from green-flag conditions to yellow. That signified "less than ideal conditions" and is the second on the four-level scale from green to black. 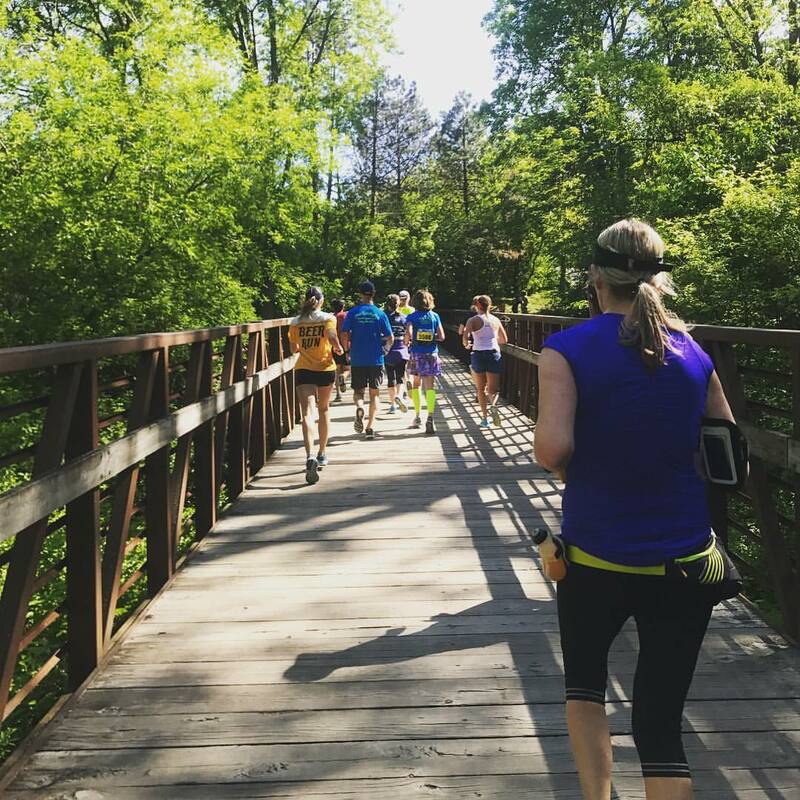 We came off of Pine Street, and curved our way through another quiet residential area as we ran on Foster Street, before crossing the railroad tracks on Home Avenue and curving down some noticeably downhill Austin Drive and the curvy streets of Cove Road. We then made our way along the bike path and Flynn Avenue through Oakledge Park, getting some much needed shade as we labored right past the halfway point of the race. 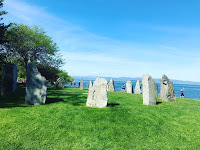 As we went through the park, we passed by a unique sculpture of 14 huge granite stones known as the Burlington Earth Clock, that creates a clock, compass and calendar. The stones weigh between 3.5 and 20 tons. 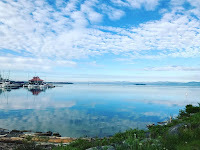 We also ran along a few bridges, and were afforded some absolutely gorgeous views of Lake Champlain. 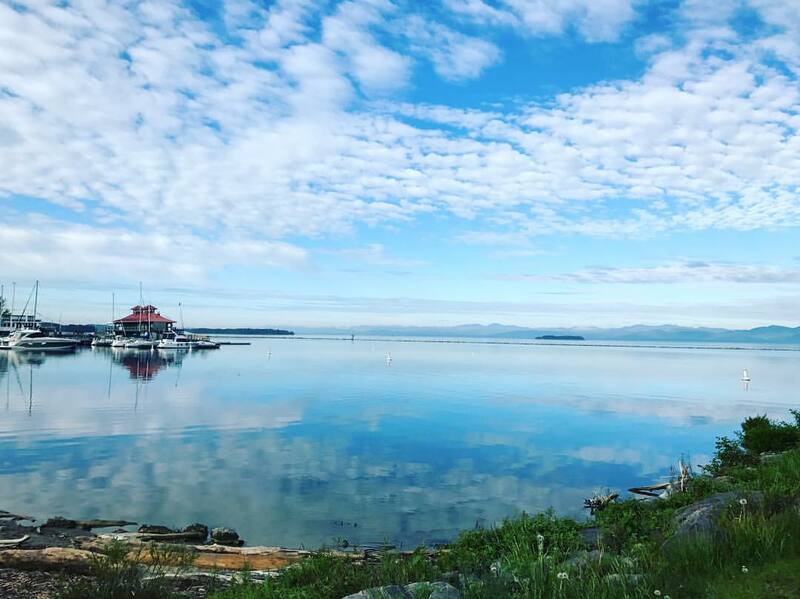 Beautiful views of Lake Champlain just after the halfway point. Eventually the course put us back onto the roads, turning left onto Central Avenue and then right along Lakeside Avenue (and some less than stellar views, as well as an ugly factory - this was probably the least impressive part of the course) and then finally at the left turn back onto Pine Street at the 14 mile mark, with that ugly uphill for the next 3/4 mile I was anticipating and wasn't thrilled about. I trudged along, but knew that this uphill was peanuts compared to what we were going to have to do very shortly. Struggling up the "Assault on Battery"
We turned left onto Maple Street, then ran two blocks west to Battery Street. And then, there it was. 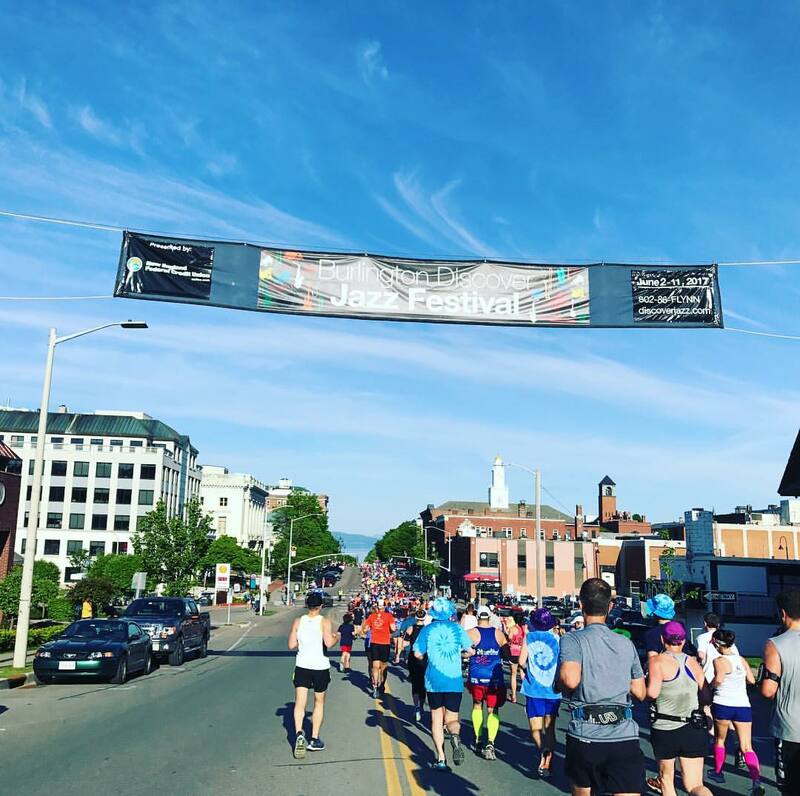 The massive 100' hill climb, starting from Main Street up to Pearl Street, which local runners refer to as the "Assualt on Battery." But we were cheered on by so many people as we came up Battery... it just sucked getting passed by people who were likely fresh, having just started their relay legs earlier near the 13 mile point of the race, but oh well. What can you do? Once we reached the "summit," we turned left onto the driveway within Battery Park facing Pearl Street, where we were awarded with a much needed candy station. We could see Park Street from our position in Battery Park and the start banner (for the third time) as we looped around the drive way and emerged out onto North Avenue which we would follow for the fourth and final leaf of the clover, however the longest of all four parts. We would be running along a long stretch of North Avenue that went back into the Old North End, and eventually into the New North End. 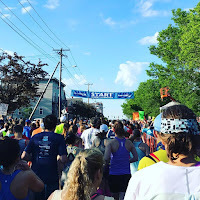 We were now 15.5 miles into the race, and for the next 2+ miles, we would stay along the shoulder of North Avenue; parts of this stretch were monotonous. This seemed to be the quietest and somewhat loneliest part of the race for me. At the same time, I was tired, and with the heat, humidity, and sun, I had slowed down a bit. The 4:30 pacers passed me early on as we ran northward. There were a few houses across the street, with some spectators cheering runners on, but then again, they were ACROSS the street. The views weren't so amazing either, as we passed on the left: Burlington College, Lakeview Cemetery, and Burlington High School. 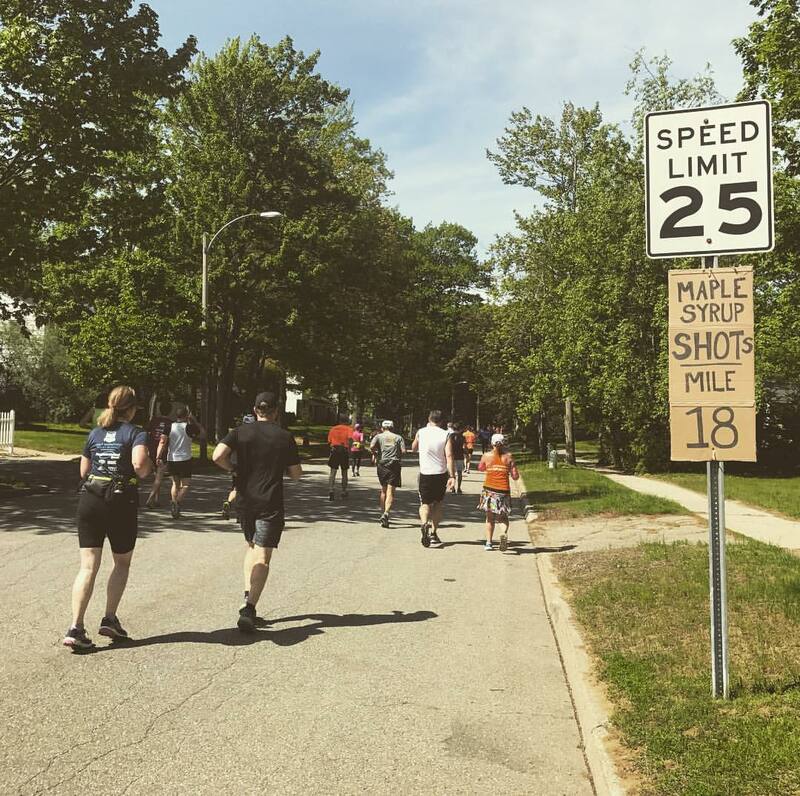 As I hit mile 17, I passed the three hour mark of the race, and the heat was up to 70, prompting the marathon officials to raise the alert level one more up to red, or "high risk." Thank god for ice pops. Finally, we got to a turn, about 17.75 miles in: the Lakewood Estates neighborhood of the New North End. This was quite the happening area. 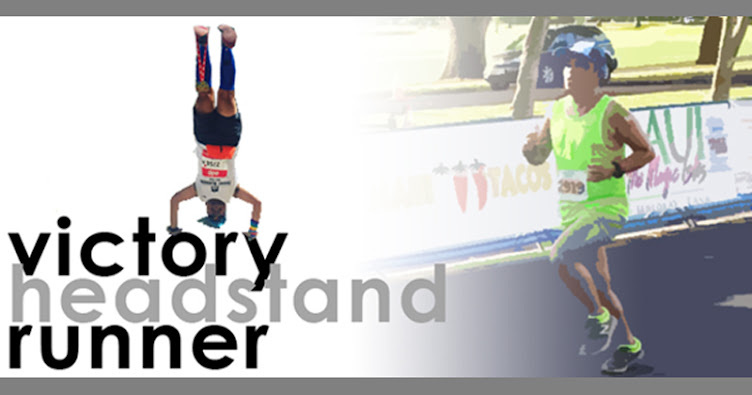 Even if it was only a short mile long section of the race, it was memorable. 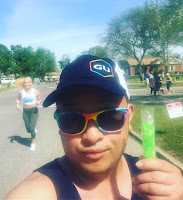 We had slogged through that two mile section of the course, and were rewarded with ice pops! And then it seemed every other house had a water station set out for us. At mile 18, there were maple syrup shots -- and it was the strong, concentrated kind! And there was even a rock band out playing in the drive way of one of the homes. To top it all off... I found a corgi! 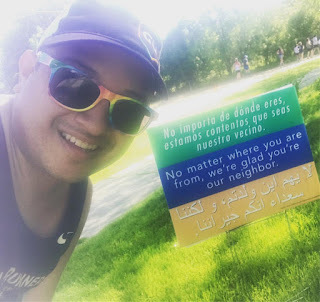 Easily, this neighborhood gave me a nice pick me up after a tough section of the race. Sadly, the 4:45 pacers pushed right past as I was enjoying myself through Lakewood Estates. 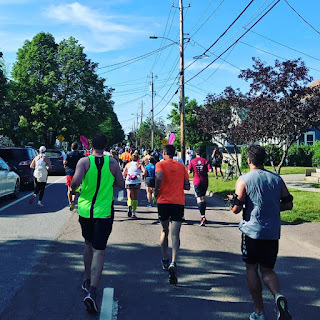 We re-emerged out onto North Avenue, but only went a couple blocks before we turned left once again onto Leddy Park Road, and were greeted by a water station manned by elementary school kids who were cheering on their teachers running the race, which was really cute! Finally, there was some slight shade which was needed, as the 10:30am sun was absolutely blazing. It wasn't nearly as a hot as last year's edition of the race, but it was still warm enough for me to get water to pour over my head or stuff ice under my hat when possible. We crossed through a large open parking lot for Leddy Park, before passing through a woodsy section on a dirt trail, eventually emerging on the other side onto residential roads. 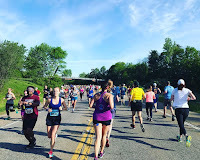 Continuing northwestward we went, progressing through a litany of the same looking residential homes in this neighborhood of Oakland Terrace, with residents out in force still cheering us on as we reached the always tough 20 mile mark of the race course. We eventually ended back up on North Avenue (Lord, when will it end...) knowing full well that the 22 mile mark would be the furthest north we'd go, and then we'd be heading back southeastward toward Waterfront Park along the bike path. Realizing I made it under 5 hours! We pushed pushed pushed, trying to overcome the sweltering heat, and looped up around North Avenue until we couldn't anymore (the street ended and whisked us westward toward the lake), which was right next to the Winooski River, and then turned left onto the bike path that would take us all the way to the finish. Some of it shaded, other times not. It was 4.2 miles of stop and go, but I progressed as best as I could. I kept an eye on my watch thinking... "ok, a sub-5 hour marathon is still in my sights. Keep a steady pace." 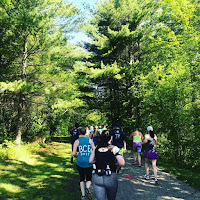 Smartly, there were lots of volunteers, both stationary and roving, and especially medical volunteers all along the bike trail, keeping an eye on runners who looked like they were getting dehydrated or feeling the ill-effects of the heat. 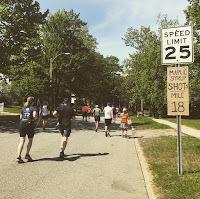 Eventually, we made it to mile 25, and we could already hear the faint amplification of cheering at the finish line. Soldier on we went, to the most exposed part of the bike trail, and then the path narrowed as the finish line was visible in the distance. I heard the announcer say the 5:00 clock time had passed as I was within 100 feet away of the finish, which meant I had about a minute and a half to make it to the finish under the 5 hour mark (having started around a minute and a half after the gun). I knew I was in good shape, and I crossed the line in a miraculous 4:59:01. Cutting it REAL close. Oh, and for good measure, I found out what the temps were at the finish line. Hot and steamy, it was a whole 21 degrees warmer than it was five hours ago... up to 75°. I stop for corgis! And in Vermont... I got TWO! 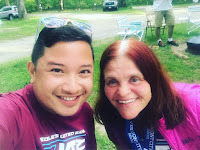 After passing through the chute, I spotted Jess near the finish line stage where the announcers were cheerfully calling the marathoner finishers in, so I headed over to her to say hi, not to mention get out of the sun since the announcers were shaded by a tent. 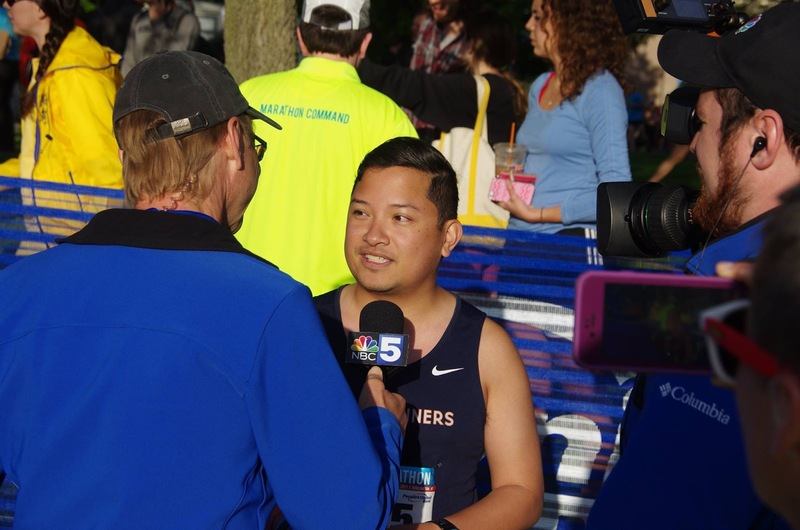 They even got me to say a few words on the microphone to express my thanks to everyone with the race and the people of Burlington. 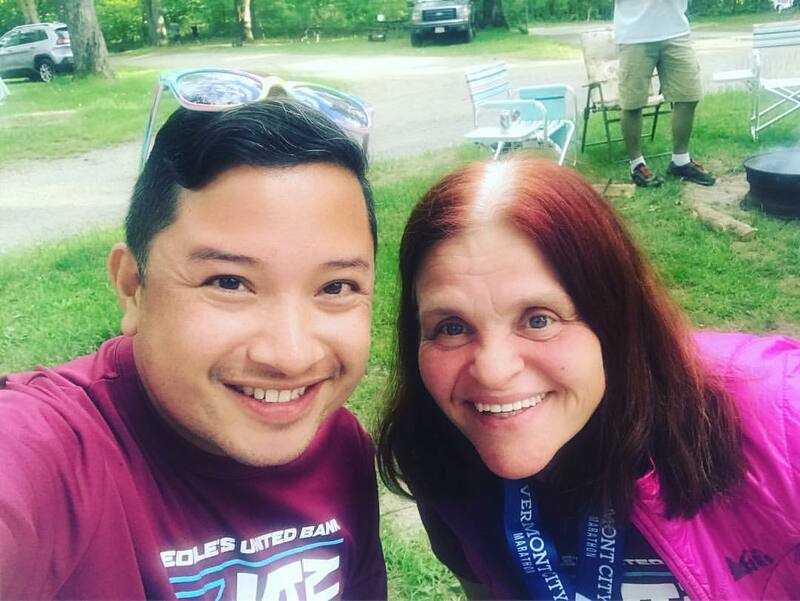 After cooling down, I found Marathon Maniac friend Jun (who I met at April's Newport Rhode Races Marathon in Rhode Island), who in turn introduced me to Jayvee, another runner from New York City! 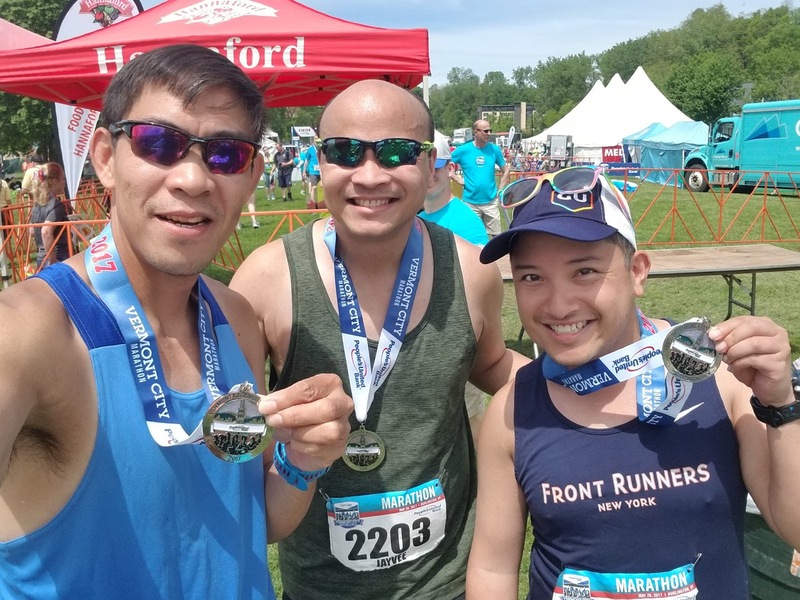 We grabbed a quick photo of the three of us Pinoy runners before I waited around for Donna to finish. 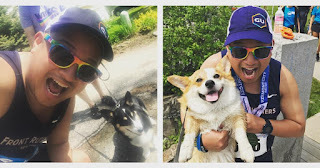 After Donna came through the chute, we took my customary victory headstand photo near Lake Champlain, and also happened to capture a photo with some cheerful corgis wandering around with their owners in the post-race finish festival in Waterfront Park. 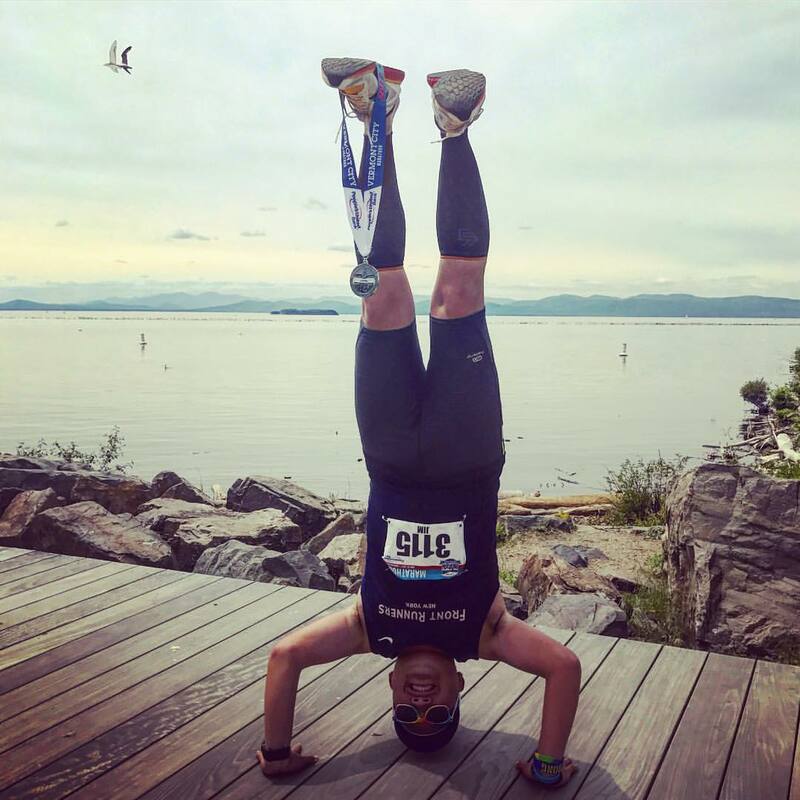 Many thanks to RunVermont's Marketing and Communications Director, Jess Cover, who has been amazing in every way with my involvement with this race! With all of us finished with the race, we went back to the car. Donna had a few hours drive back down to Boston to catch a flight back home, and I was dropped off at the home of RunVermont board member Karen, who Jess connected me with and was willing to house me for the two nights I had planned to remain in Burlington to continue discovering the area. 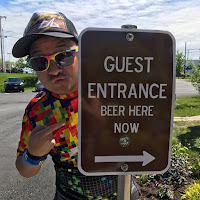 I was able to drop my things off and take a shower before I headed to the Burlington airport myself to pick up a rental car that I would make use of for the rest of my long weekend in town. With fellow VCM finisher Ingrid! When I picked up my rental car at the airport, I found a wallet on the ground at the rental car garage. The wallet had the owner's ID, several credit cards, and other important items. I immediately searched for her thru Facebook and Google; I luckily found her, emailing and messaging her with my details to contact me as soon as she could. Meanwhile, I had some friends to visit with to take up the rest of the day. 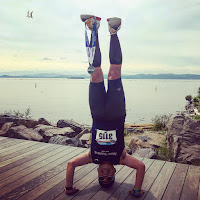 I was able to get ahold of a friend, Ingrid, who lived in Vermont and was running the marathon. 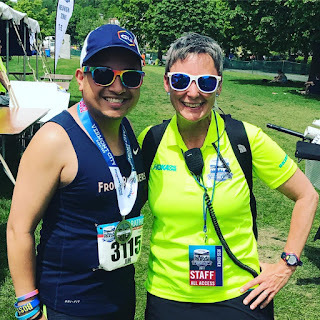 She and I met during the San Francisco Marathon, when my friend Ryan was helping pace me in my second 26.2 of the San Francisco Ultra that I had started at midnight. 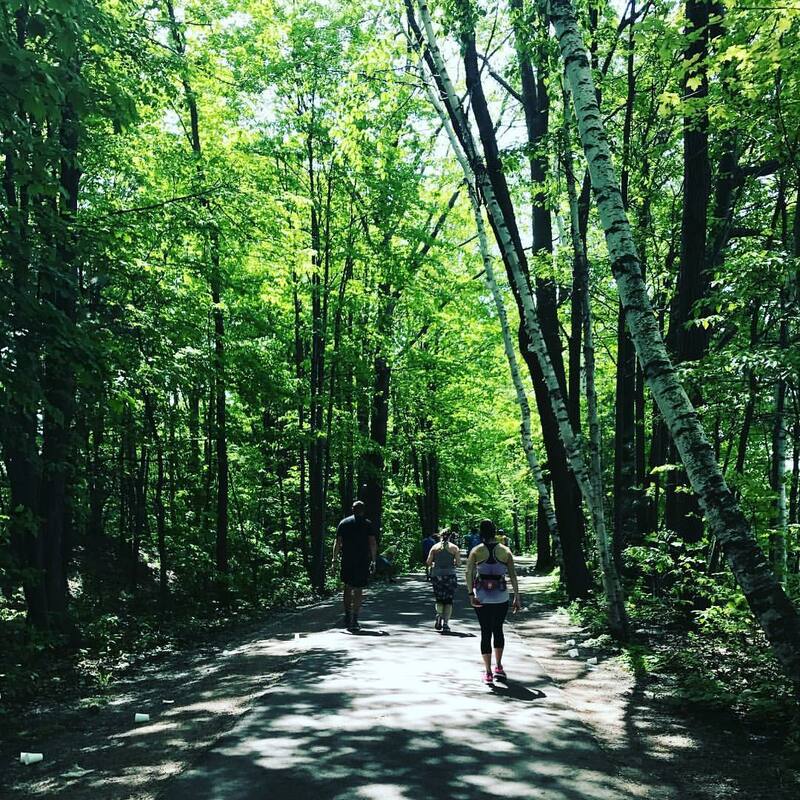 Her family drove an RV from their home two hours southeast of Burlington to spend the long weekend along the lake at the North Beach Campground. It was nice to join them for some beach time along the lakeshore, have some burgers and enjoy each others company for a few hours. 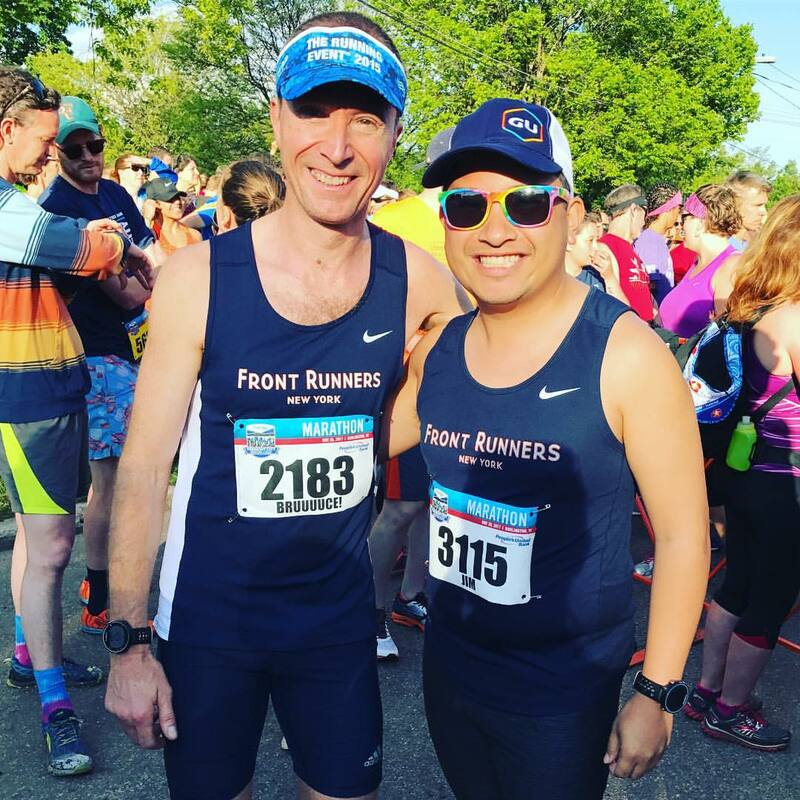 Before the evening ended, I contacted Coach Mike, who I saw at the start of the race earlier that morning, and we met up for a beer at Three Needs Brewery. 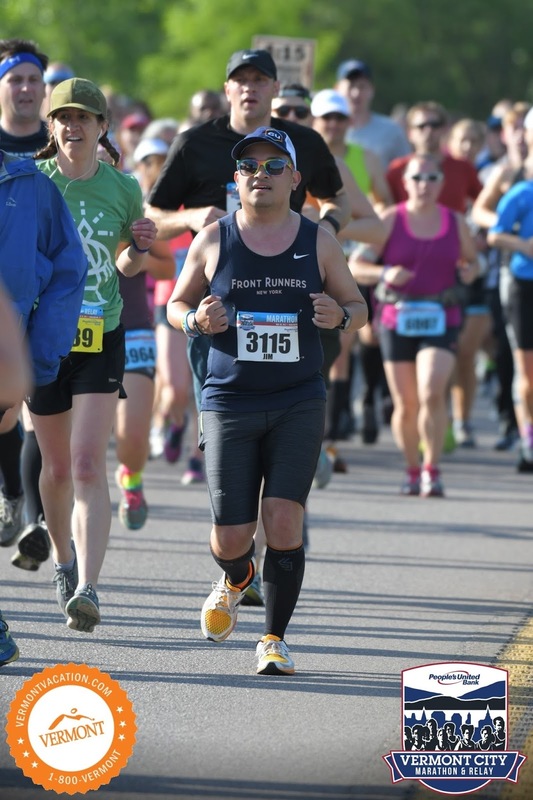 After a couple pints, I was ready to hit the hay - getting up early and running 26.2 miles in high heat apparently tires you out! I had planned to go to Montreal the next morning, taking advantage of how close we were to the Canadian border, and I had conveniently brought my passport with me, but with the weather taking a forecasted turn, being rainy pretty much all day, I opted to discover more of northern Vermont instead, figuring out that some spots would still be open despite the federal holiday. Meanwhile, I woke up to a voicemail from the woman who had lost her wallet at the rental car garage -- luckily, she was still in the area, so we arranged to meet up later that afternoon so I could return the wallet to her during my sightseeing. Turns out, she has a fussy toddler that may have accidentally bumped it loose from a bag when they were leaving the airport; thankfully, she had not begun to cancel any of the cards! After freshening up to get ready for the day, I came downstairs to meet up with my hosts Karen and Bill, who arranged to get some delicious Montreal-style bagels for breakfast from Burlington favorite Myer's Bagel Bakery. Braving the weather, I headed out and took the US 89 east out of Burlington toward Vermont's capital, Montpelier. Montpelier is known as the least populous state capital in the United States, with a population of under 8,000 residents. 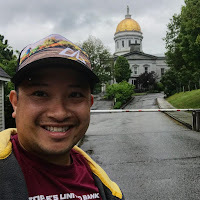 Its most well known landmark is the Vermont State House, with its noticeable golden dome, which I stopped to take a picture with, as well as check out some of the bridge crossings over the Winooski River, which flows right through town, just a block away. Continuing my food sampling and needing to get some maple syrup related mementos to bring back home for coworkers, I found out that Morse Farm Maple Sugarworks, only ten minutes north of the State House, was open. 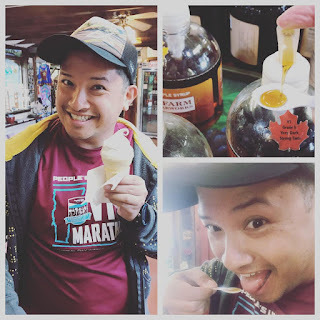 I got to try some of the different maple syrups that are available, which vary in grade - meaning distinct color and taste differences. And I also got to sample a delicious maple creamee, a Vermont summer staple, which is basically maple syrup flavored soft-serve. 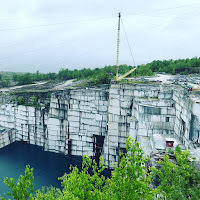 While at Morse Farm Maple Sugarworks, I looked through brochures of area sites and realized that nearby Graniteville, Vermont, was home to one of the most significant granite quarries in North America, where some of the highest quality granite can be found. A facility called Rock of Ages, with a large plant where huge blocks of granite are moved around, cut, polished, and engraved for gravestones, is nearby, and offers tours to the public. 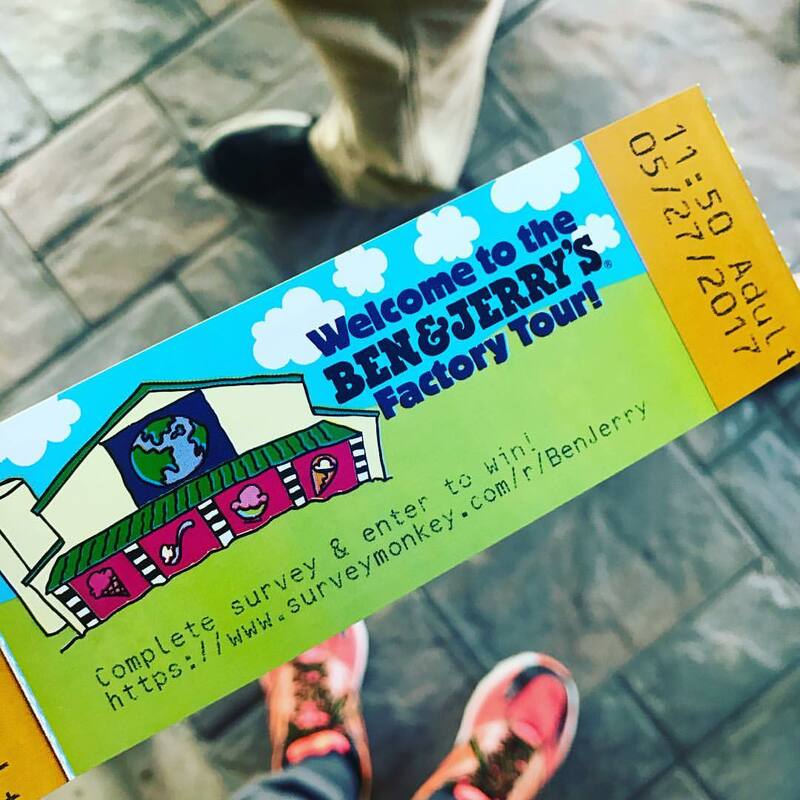 Unfortunately, the plant was closed, but the visitors center was open for guests, who could watch a short film depicting the history of the site and how the granite gets turned into its finished products. A guide led us by car to caravan up a bumpy gravel road to the quarry site. 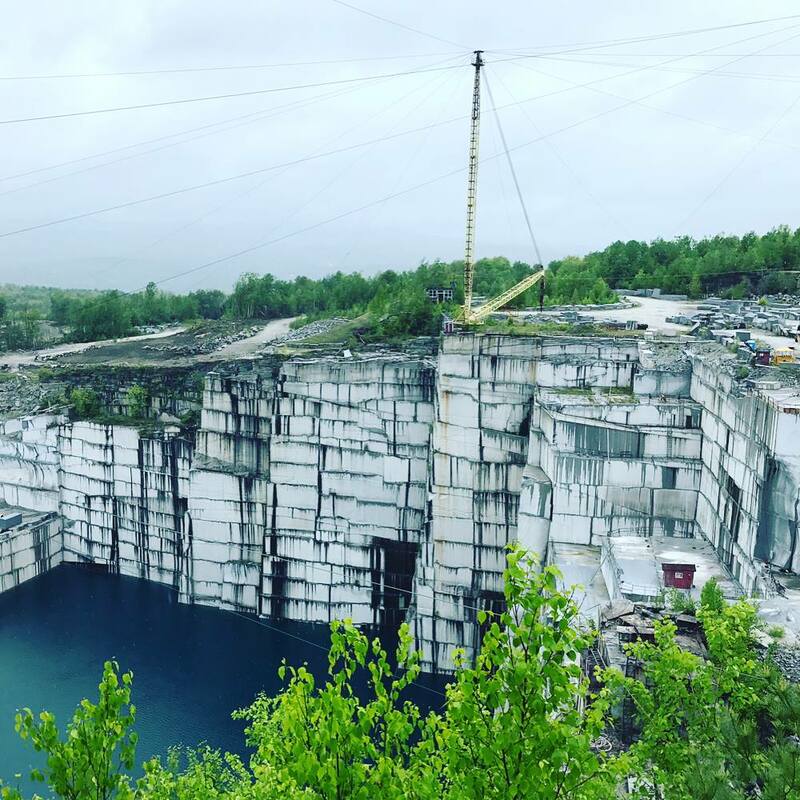 It is considered the world’s largest deep-hole dimension granite quarry, and though 600 feet of its depths are under a well of milky-green water. In the film, we were able to see some of the finish products of the granite, many of which are turned into the highest quality headstones that can be found anywhere in America. Many of the most unique headstones can be found in nearby Hope Cemetery in Barre, Vermont - granite sculpted into extremely intricate designs or even into objects like soccer balls and even a corvette. The cemetery is veritable gallery of granite artistry. 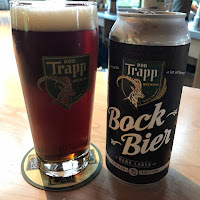 I headed up to Stowe to meet up with the owner of the wallet, and we agreed to meet up at the von Trapp Brewing Bierhall, where I was able to get a delicious schnitzel lunch. You may look at von Trapp and think... "what? Von Trapp? as in Sound of Music?" and you'd be correct... in fact, the real Von Trapps had emigrated from Austria to the US after the war, and settled in Vermont, as the mountain scenes reminded them so much of their native Austria. It was particularly European-feeling that day, as the rain clouds moved in and out around the woods in the distance, feeling like I was in the arboreal forests at the foot of the Alps. Not far from the Bierhall is the Trapp Family Lodge, an Austrian-style resort catering to the nearby ski resort of Stowe. Before leaving this area, I had to drive up to Smugglers Notch Road, a mountain pass known for being Vermont's most dramatic road, passing through picturesque forests and bold rock outcroppings, the state's most famous resort village, and over a shoulder of Mount Mansfield, its highest mountain. Numerous pull-offs can be found off of the road, and some of the plants along the route are found there and nowhere else in Vermont. The weather was cause for some concern because of how slick it was, and how windy the area could get - and not only that, the road is extremely narrow, so drivers are cautioned to take care as they wind around big boulders, curve around some very round corners, and deal with some steep elevation change that make up much of the road. Beer + poutine. What a dinner! With the day waning down, I decided to hit up one more spot to grab food before heading back to Burlington for the night - on recommendation, my host Bill had suggested I stop into Prohibition Pig in Waterbury to try some more local craft brews - and it definitely did not disappoint. And for dinner... poutine, topped with brisket. SOOO good. 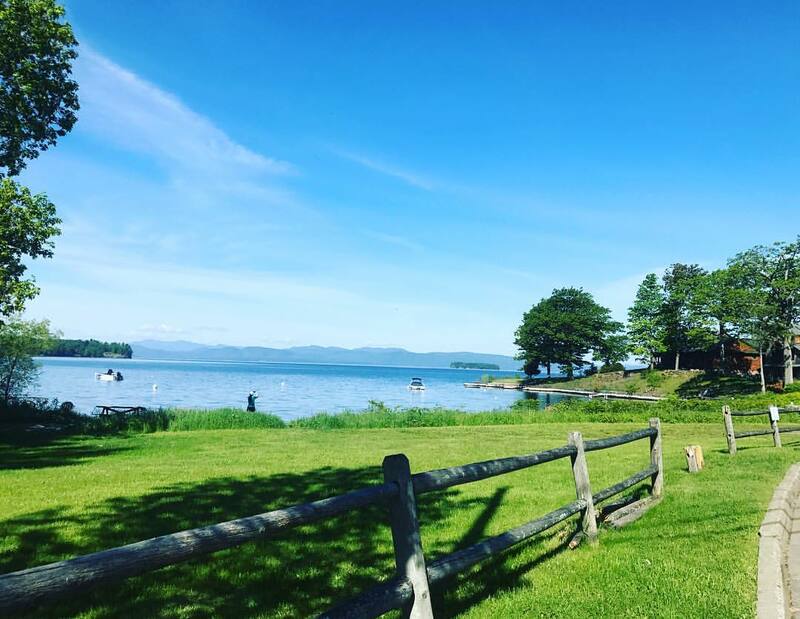 With the long weekend over, I spent one more night at Karen and Bill's, and early the next morning headed to Burlington airport to board the first flight back to New York City at 6am... I flew into LaGuardia, stopped home for a shower, and then went straight to work... what a weekend!